Arcane Roots have stumbled onto the perfect combination of pop and rock to create a truly awesome sound. With strong comparisons to early Biffy Clyro, Arcane Roots combine melodic vocals with hard hitting guitars and obscure but delightful time changes. With a new EP just released('Left Fire EP'), the band have done well to catch their musical power on record, having said this it is live where the band really show their true potential, with a blistering show that leaves you mesmerized and begging for more. For Fans Of: Biffy Clyro, Foo Fighters and At The Drive In. 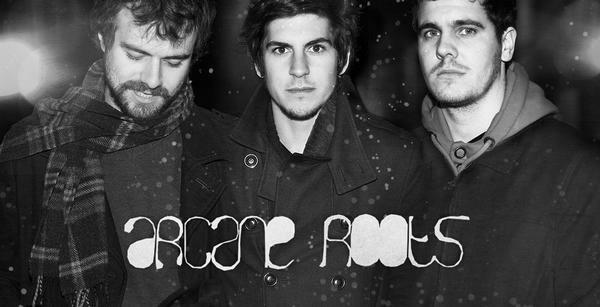 Arcane Roots: Hopefully they'll see us as some fresh air to music at the moment. We love energetic, exciting and clever musicianship with great melody and song, so we started writing songs because there was no one making what we wanted to hear and i'd like to think we've achieved that (after A LOT of work and sweat and life), a balance of hard rock and pop. We have passionate songs that we put everything into and we give even more live, so please do check us out. AR: Andrew (Vox + Guitar) and Daryl (Drums) met at Reigate College after playing in a few bands together and after many four, five, and six pieces...ended up as a three piece with previous bassist Frank. After building a small following and getting some recordings under our belt, Frank left to pursue a life of trees and we found Adam (Bass) and he fitted in perfectly, completing the line-up. After a few small tours, management and a whole load of gigs we felt ready to make something to show people what we were about... and that became 'Left Fire', our mini album out now. AR: We'll after the magic of making our mini-album with Chris Coulter, we got to go on a tour with Sucioperro, it really cemented it in all of our heads that this is what we want to do for the rest of our lives. We were driving through the Peak District on the way down to Leicester, and we stopped at a little restaurant surrounded by the most beautiful scenery and weather/ It was the best feeling to know that we were playing another show that night. AR: We've just put out 'Left Fire' which is an 8 track mini-album, available on our bandcamp as a physical release, and digitally on iTunes. We're now starting to book some tours to get that out on the road and into your local venues. We hope to do a European tour with an amazing Norwegian band called 22 next spring, and we're speaking to a few bands about doing UK tours with them through the year, please check the Myspace or Facebook for details on that. We're currently building a really great family of people around us, who are all amazing at their work and want to help us out, and with them we've been slowly putting together a live DVD and documentary which should be released sometime next year too. We've come this far all by ourselves and so are now looking to work with people who can take it further and help us get more exposure, so ideally a nice independent label will want to do a single with us before the end of the year and we can make some new music again. Arcane Roots on MySpace and Bandcamp.